Personalise a square photo book from bonusprint to keep cosy family photos close or to share stunning shots in an extra-large album. There’s a great range to choose from, so get creating and order yours online. 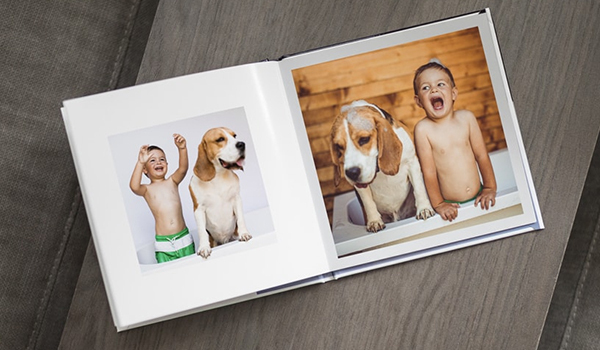 Square photo books are a great way to relive all of your favourite family moments. A 10 x 10 cm photo album is perfect for popping in your bag if you’re away from home. And an extra-large 30 x 30 cm square photo album is ideal for showing off wedding shots of your special day. A personalised medium square photo book makes a great hobby book or keepsake when you’re looking for gift ideas. And they make adorable baby books too, so you can record all of their mini milestones in one beautifully printed photo album. Making a square photo book that’s unique to you is easy with our creator tool. First, pick your size and format – you can choose from a selection of landscape photo books, portrait photo books and square photo books. Certain sizes are also available with a soft cover. So, if you want a lightweight album to carry all of your cosy family photos around with you, a 10 x 10 cm photo book would be perfect. When you’re happy with the size of your square photo book, you can have some fun experimenting with the creator tool. With the creator tool, you can upload your images and try as many different layouts as you like. You can also add masks, frames, clip art, backgrounds and captions to personalise your square photo album. Once you’re happy with your design, click ‘add to basket’. Here, you can add the finishing touches. You can select a cover for your book and add a title. And to give your snaps a professional-looking finish, why not go for glossy paper? All that’s left to do is to place your order and get your new square photo book delivered to your door. A most effective and professional result on every occasion I have used Bonus Print - but the full price is expensive and I only order a photo book when there is a special offer.